Pwede nang mag “pucha pucha hands up” anywhere you are! [27 January 2016] Amidst the frenzy of revelers at the much celebrated Dinagyang Festival in Iloilo over the weekend, unrivaled mobile services leader Smart Communications, Inc. (Smart) broke new ground as it became the first brand to pilot Facebook Live in the Philippines. The latest feature of the world’s biggest social networking site, Facebook Live allows users to broadcast live video content as a new way to engage followers. For a more shared experience, Facebook Live also allows viewers to post their comments and interact with each other in real time. The feature was first introduced for use by US celebrities last August, and was then rolled out for verified accounts of public figures, news sites, brands and other users just last month. Viewers from all over the country got to share the Dinagyang Festival experience via Smart’s pilot Live Video on its Facebook page. The live video came as a regular notification to the followers of Smart’s official account on Facebook. Upon clicking the notification, they were directed to the live video, which featured the rousing beats of Smart ambassadors and party staples DJ Ace Ramos and MC Pao. Viewers from all over the county streamed in and posted their reactions – mostly in awe of the new feature and thrilled to be able to join the celebrations virtually on their mobile devices: “Ang sarap pumasok sa screen at maki-party (If only I could enter the screen and join the party)!,” commented user Jaylord Ambe. “This is amazing!,” user Jr Florentino chimed in. 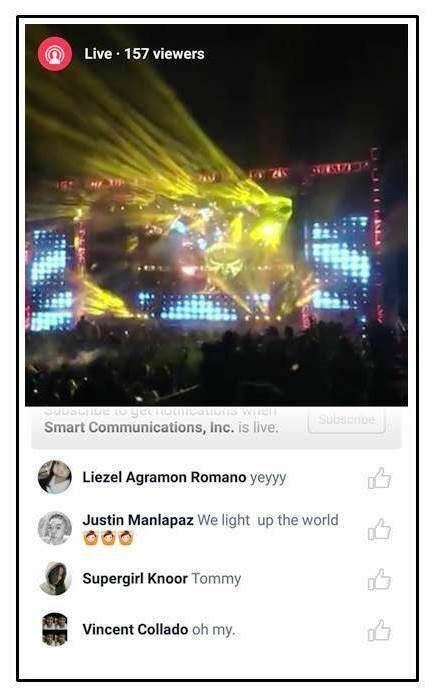 The next day, Smart once again tapped Facebook Live to broadcast the set of Smart Ambassador Inno Naguit at the Dinagyang Invasion, another major electronic dance music celebration, eliciting positive responses from viewers who got to share the festival experience despite being miles away. Each Facebook Live video was automatically published on Smart’s Facebook page, which was later viewed and shared by the thousands of followers. “Smart has always been at the forefront of mobile innovations in the country, and we are very honored and thrilled to be the first brand to launch Facebook Live in the Philippines, which promises another awesome Smart Life experience for Facebook users,” said Kathy Carag, Smart Brand Head. “This new feature not only stretches the capabilities of Facebook, but also opens great possibilities for us to enrich the mobile lifestyle of our subscribers, who can now tune in to witness significant events and share the experience with others in real time – all with just a few taps on their smartphone,” she added. Smart’s launch of Facebook Live follows a string of mobile innovations and product offers which Smart introduced to keep Filipinos abreast with the latest technologies, enriching their digital lifestyle. Smart recently pioneered the ‘Shared Data’ scheme which allowed postpaid and prepaid subscribers to share data volume conveniently with their loved ones so as to keep them connected online, with access to the widest breadth of digital content – from music and videos to games and more – on their mobile devices. Last year, Smart led the way for Southeast Asia’s first Smart LTE Multicast of a live event through the use of the evolved Multimedia Broadcast Multicast Services (eMBMS). After pioneering and launching the use of LTE in the Philippines in 2012, Smart also conducted the country’s first trial of LTE-Advanced in 2013, joining only a handful of carriers around the world with such capability. Smart offers fast and reliable broadband services via its nation-widest network, which is backed by the country’s most extensive fiber optic footprint that spans over 100,000 kilometers. There you go! San next ganap?